The other day we talked about retraining our brains. One area in which my brain really needed to be retrained was in regards to at-home workouts. Although I enjoyed the infomercials, I never Sweat To The Oldies with Richard Simmons because I always preferred to go to a gym for a group fitness class than attempt to hold one in my living room. I struggle enough with accepting that my DVD Player is actually the Play Station 4 to the point where I walk around cursing/reminiscing about how easy life once was back when we owned a VCR with actual buttons which said PLAY, STOP, REWIND and EJECT. 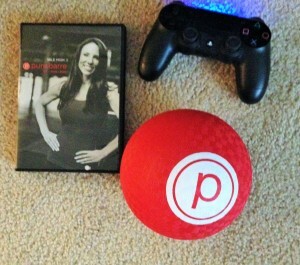 Everything has started to change though since I fell in love with Pure Barre over the summer. Is it just me or is it weird that the remote for my DVD player is a video game controller? I loved attending the classes twice a week at my local Pure Barre studio. I loved how the routine made my muscles feel as well as the changes I noticed in myself both in my strength and appearance within a matter of just twelve classes. What I didn’t love was the price per class after the new client special expired. I can usually rationalize any expenditure but even better than that, I have a knack for balancing out the indulgent expenses with thrifty purchases. A good pair of Chanel shoes paired with a marked-down Aqua dress from Bloomingdales during Private Sale plus triple points is always a win-win. With all of the fall expenses coming out of my check book (back-to-school clothes, winter coats, my son’s birthday, Hanukkah approaching, sports registrations, PTA dues, Hebrew school…) there was no way I was able rationalize a Pure Barre package. But the Pure Barre DVD’s can balance the budget nicely and keep me lifting, toning and burning! I forced my brain to understand that it was time to not only invest in a Pure Barre DVD set, but to invest the time and commitment into making these DVD’s work for me from home. That’s it right there folks — Investing the time and making the commitment. If you want it bad enough, you are going to stick to it. It’s just like winter running and the treadmill. Are you really going to skip your long run because it’s a blizzard when you have access to a treadmill? I did some searching and discovered that ordering through the Pure Barre website came out to a better price than Amazon. I selected the Mile High DVD Set mainly because it was a great deal which included two videos, the red ball and pair of the grippy socks. I already had the socks but the price of this deal was too good to pass up. Do I think you need the socks? Yes and no. They do help you to grip the ground which I find I need most when doing the plank exercises. Otherwise, I sort of think you can do this barefoot. It is your house after all. They tell you to use a yoga mat, I don’t. I don’t even own one. I don’t do yoga or ever work out from home (until now) so why would I own a mat? You do not need it if you don’t already have one. What about a ballet barre? I actually hold on to the ledge/counter but you can utilize the back of a chair as well. I wanted to share a picture of me “tucking” while holding on to the ledge/counter but no one (read:my son) was willing to take the photo just yet. *So much of the routine is identical yet the DVD’s that I selected are completely missing the arm circuit which is typically done right after the warm up. At first this really bothered me but I do recall the entire circuit so I try to do it on my own once or twice a week. *This DVD set in particular makes much more use of the red ball than I realized I would like. My hamstring was getting tight from one seat exercise so I learned to drop the ball. Literally. I realized that holding the ball behind my knee was tensing my right hamstring and I really didn’t need that. I simply do the routine without the ball and it’s just fine that way especially since we did the same exercise in class without the ball too. *I also stopped placing the red ball between my legs for planks. We didn’t do this during the actual classes and I find it more comfortable without. *The DVD’s also leave out the “bend-stretch” terminology you may be used to hearing/doing in class. I am not sure if the other DVD’s are the same. Since I started posting Weekly Workout Recaps, we will both be able to keep track of how often I am lifting, toning and burning from home. I aim for every other day when possible although I think it averages out more like three times a week. I alternate my videos each time I workout so that I never get bored with the routine. I never thought I would say this but I actually love that I can do this from the comforts of my home. Think about it…you can pop this DVD in at any time be it early morning or late at night, during a snowstorm, when the kids are home sick from school or if you have an infant or toddler which makes getting to a gym on a routine basis slightly difficult. I used to think I would be unable to focus on an at-home workout but the concentration needed for Pure Barre gets you engrossed every time. It goes by so quickly too! I promise you won’t even dread the routine. Sure, it burns a bit and makes you shake sometimes but there is something relaxing about the lifting, toning and burning that makes your body crave it if you go a day or two without it. The stretching and isometric movements are so non-impact and easy on the joints making the routine a perfect complement to your running. I do not sweat from this routine but I swear to you the changes in your muscles, strength and appearance are real and happen quickly. One DVD at regular price is the same price or less than one Pure Barre class. I am considering ordering another DVD just to add even more variety into my routine. 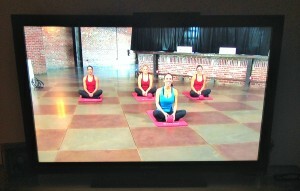 I am really proud of myself for making these Pure Barre DVD’s work for me from home. I know it’s evident that my motivation is there when it comes to running and fitness but working out from home was NEVER something I would consider. I know that some of us have schedules with very little flexibility. Jobs which require long work hours, long commute hours and/or running a household of little children which can all contribute to lack of time to hit the gym or run a trail. I do believe that we can all carve out thirty something minutes just a couple of times a week for fitness though regardless of our hectic schedules. If you want it, you find the time. If you don’t truly want to make it happen, you find an excuse. Are you an at-home workout person? Which DVD’s/workouts do you like the best? If you attend barre classes, are you fascinated by the results from the routine? Do you miss the days of the VCR?! I am NOT good about working out at home. That is definitely something that I need to retrain my brain around. I just need to go to the gym, but then again, I need to retrain my brain to being fully engaged when I am there, too! I guess I should have known it was only a matter of time before they made DVDS, I think I would enjoy it more at home too. I still need to give it a try. Maybe during my 2 weeks off after the marathon. 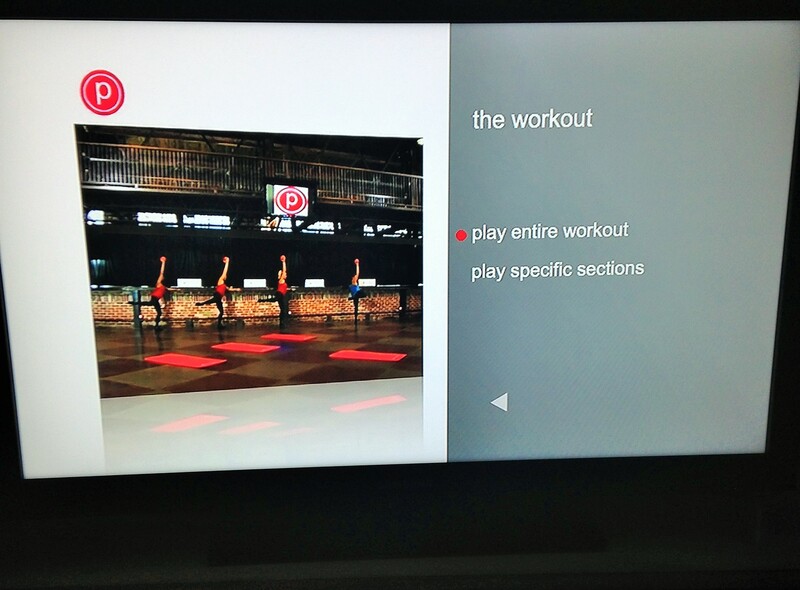 I don’t think I have ever done an at home workout though…..apart from maybe a free on demand yoga video! I can’t say I miss VHS, especially that noise you always dreaded to hear as it tangled itself up! Definitely give it a try, I love it. It’s so low impact and the stretching is great. Not to mention, it gets me to do more core work than I was doing on my own. I’m an at home workout person. I love love my workout room! I was sure that meant no options to try Pure Barre. I’m definitely looking into this! Definitely look into a DVD or two. I always think of you when I do the routine from home because I recall you saying how much you love your workout room in your house and how you enjoy your home workout routine. I am really liking the Pure Barre set up I have going and it is a great complement to my running. Let me know if you try it. I used to do nothing but home workouts from highs school until I got a job at a gym a year ago. I wasn’t comfortable doing anything new. Now I find The gym more motivating. I always appreciated the gym so much but I am learning that it’s possible to like a good workout at home as well. When the gym in my community was renovated, I canceled my outside gym membership. Although I am more limited in my workout routine variety, I have learned to totally make it work for me and I am saving money too! I realize this is an old blog post, but I just came across it. Thanks so much for the review- I recently started PB and I LOVE it but do not love the price tag. Does the DVD have the equivalent of one class, or are there multiple exercises? Are you doing the same exercises on the DVD or are there enough that you can change it up? Hi! 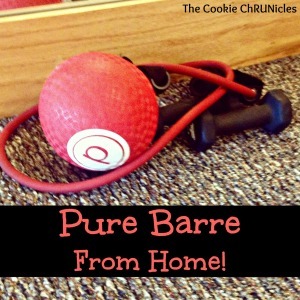 I have written a ton of other Pure Barre posts and a fairly recent one reviewing the Pure Barre Pure Results online workout. You can check my workout section under the running tab at the top of my site for all of the posts. There are a variety of DVD’s of different lengths which I discuss in the posts. Some are 35 minutes, some are 45 and the new online workout (the pure results) is 65 minutes. They all follow the same class structure. I definitely recommend them all. Please let me know if you have any other questions after reading the posts.